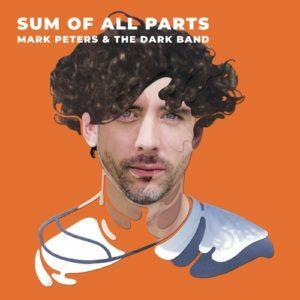 “Sum of All Parts,” opens Mark Peters and The Dark Band’s latest EP. It’s a song that begins quietly but then reveals itself to be quite strong. Peters’ mature vocal confidence and precise production grab the listener from the get-go. The laconic drums (at least in the verses) from Fabian Natter and the electric guitar touches from Martin Burtscher are just perfect. The harmony vocals are the last little bit making this an excellent opening salvo. “Failure is My Friend,” the second tune here, is quieter, starting with Peters on tickling acoustic and warbling in his higher range. Then the Dark Band, (Peter’s most current project) slips in behind him playing precisely, as well as providing color. Again, there are great harmonies on this one. “Highs and Lows,” which ends the four-song EP, is unlike the other three tunes. It’s got a weird bluesy feel, as much manned by Burtscher’s electric (his lead here is killer), as Markus Manahl’s slow bass read and Peter’s very expressive voice. When we get to the big dramatic choruses, you can’t help but float along, infectious as this last tune is, strings rise, and the band locks deep with their frontman. Singer/songwriter stuff can get really boring for me. Yes, we all have something to say, but sometimes the execution of such introspection leaves me wanting; how many times have I simply said: “all right already, can you just rock me a little?” Mark Peters and the Dark Band deliver good solid tunes, by an obvious good songwriter, leaving the listener wanting to hear more.